Let’s Tour The 2013 HGTV Dream Home Together! I hope you have your comfy shoes on today, because it’s time for our annual tour of the HGTV Dream Home! I know many of you probably watch the big tv special on HGTV where they walk through the house, but I don’t have cable, so I have to rely on the pictures each year. 🙂 If you’ve already seen it, I hope you’ll enjoy seeing it again, and please, please tell me what your favorite (and not so favorite) features are!! I love to “walk” through the dream home each year, room by room, and see what decorating inspiration I can take away from it. Don’t you? After all, it is supposed to be a dream home! And of course, we’ll start with the exterior. There are so many things I like about the exterior. 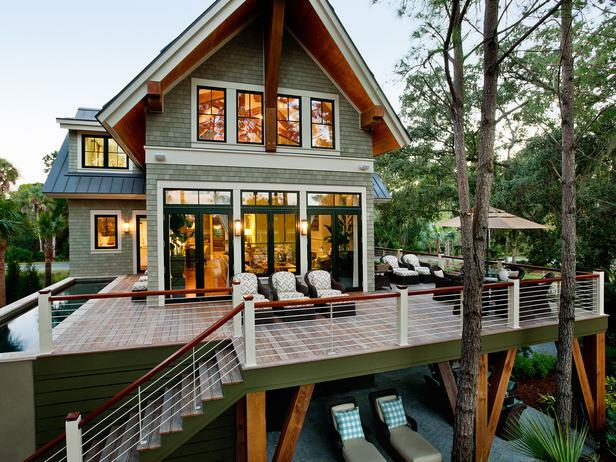 The metal roof is amazing, and my favorite thing is the shingle siding. Oh, I dream about having shingle siding!! 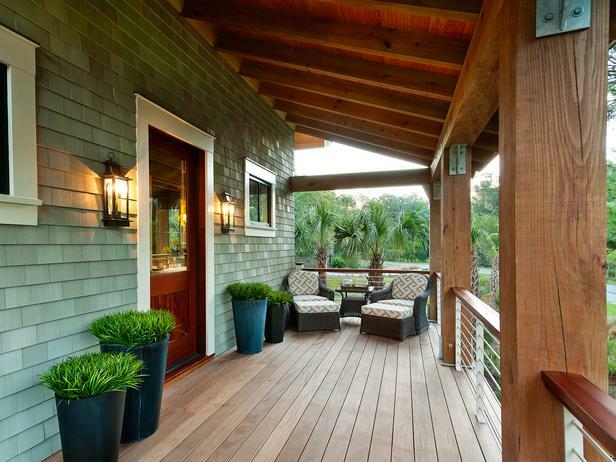 And can we talk about the porch and deck?! Such amazing spaces! What I don’t like is that the exterior seems a bit confusing to me. Perhaps it’s just the camera angle (I have no idea where the street is from here), but I don’t like houses where the garage is the focal point and the front door is tucked away. Do any of you know if that’s really how this house is arranged, or is it just the camera angle? Here’s a closer look at the amazing deck area with the plunge pool off to the left. If I had that, I’d spend hours and hours out there, with a stack of magazines and an iced tea in hand. And the beautiful front porch. Again, that shingle siding!! Oh, how I love it! The color is Sherwin Williams Svelte Sage, and I think it’s absolutely perfect next to the brown wood tones. The entry hall is one of my favorite spaces. The built-in seating with the storage below is not only beautiful, but also very functional. I’m not too crazy about the blue color, but that’s a minor thing. I think the rest of it is perfect! Now here’s were things kind of went off the tracks for me. This great room left me longing for color. I know that from other angles, you can see a chartreuse wall, fabrics, and accessories. But from this view (which I assume is straight from the entrance hall) is just a bit plain for my taste. And I know it’s challenging to fill a large vertical space like the area above the fireplace, but I think there are several other much better options than a metal gate. Something with color would have been nice. And the kitchen doesn’t do anything for me either. (Wow, am I sounding like a negative Nellie here, or what?!) 🙂 It seems a bit plain…definitely not my idea of a “dream home” kitchen. Perhaps some pretty tile on that main wall would have done the trick for me. The dining room is nice. I don’t think it’s a “wow” kind of room, but it’s nice. I definitely like the two lights above the table. Now this room cracks me up. It’s the pantry! This “pantry” is as big as my kitchen, and maybe even bigger than my kitchen!! Ha! What I wouldn’t do for this type of storage space!! A pantry like this is definitely dream home-worthy! And next up, the laundry room. Again, it doesn’t seem like anything special to me. The cabinets seem almost (dare I say?) apartment-grade to me. Now the guest bedroom I like!! I think the wall color is amazing. It’s Sherwin Williams Fawn Brindle, and I think it pairs beautifully with all of the blues used in the room. And can we talk about that bed?! Those turned spindles are so pretty! But the guest bathroom again seems so plain. There are no elements in it that I don’t like, but the room as a whole just leaves me wanting more…more texture, more color…just more. I love the kids bedroom!!! The striped walls are so fun. They were created by using semi-gloss and flat paint in the same color. 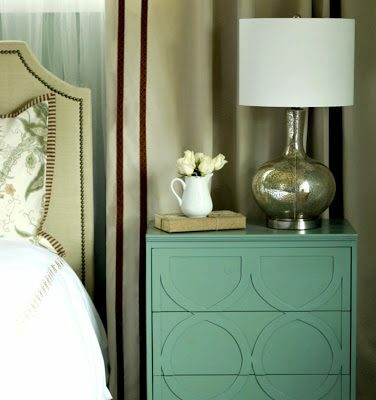 I used that technique in our first house to do a harlequin design on the master bedroom walls, and it was amazing! And the kids bathroom is right up my alley also. That mother of pearl mirror is so pretty against the aqua wall. And of course, the green vanity is one of my favorite things. Sadly, my initial reaction to the master bathroom was, “Yuck!” The tile on the wall looks dated to me. Am I crazy? What is it about this room that makes me do that involuntary scrunched-face disgusted look? I think I’d love it with a different wall tile, but that one just seems so distracting, dark, busy, and dated to me. What I DO love is the art to the far right…the sea sponges in shadow boxes! Those would be so easy to make, and perfect for a bathroom! The bunk room is so fun! What kid wouldn’t enjoy this room? The upstairs loft area is nice, but again, it just doesn’t really do anything for me. But I’d love to have a home with a loft area like that! And probably my favorite thing ever…this outdoor playroom off of the garage. It’s unique, unexpected, and brilliant! So what are your thoughts on this year’s HGTV Dream Home? It seems like each year, I find myself being less and less impressed with the dream homes. And do you know why I think that is? Honestly, I think it’s because home/DIY bloggers have really raised the bar. Almost every single day in blogland, there are bloggers showing us absolutely amazing, stunningly beautiful things (or rooms) that they’ve created, and usually on tight budgets, that look like a million bucks. There are soooo many ridiculously talented bloggers out there creating ridiculously amazing things, and I’ve become so used to seeing that level of talent and beauty on a regular basis. So when I hear the words “dream home”, I’m expecting it to be absolutely off the charts amazing. But it’s not. Previous Post Can We Discuss The Pantone Color Of The Year -- Emerald Green? I agree with your observations almost 100%. Some of it looks very dated to me, and those poor cabinets… just, no. I know…right? What were they thinking with those cabinets? I wouldn’t like those in an apartment, much less in a dream home! Ha! I think I agree with you for the most part. Most of the rooms you found to be too plain I did too, but I can totally see you liking the more colorful rooms 🙂 that seems more like your style. I am more of an “in between” girl. 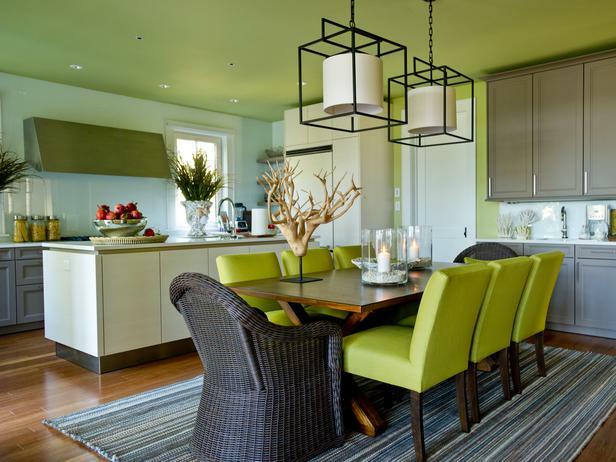 I would’ve liked to see more color in the neutral rooms, but I couldn’t bring myself to have green stripes in my house. The laundry room cabinets were disappointing. I don’t know if it was the magic of TV, but that particular room looked better on TV. The decor item that disappointed me the most were the window treatments. Even for a neutral-lover as myself, they just seemed so blah! throughout the house. My least favorite item was that antler-like sculpture? in the dinning room and I wasn’t a fan of the paintings in the loft. My three favorite rooms were the green/blue bathroom, the play room and the deck/pool area. My favorite item was the guest bedroom bed (I’M IN LOVE!). I’m definitely with you on that guest room bed. (Okay, that sounded weird.) 😀 But that bed is amazing! Probably my favorite thing in the whole house…or a close second with the mother of pearl mirror in the kids bathroom. I agree with you as well. 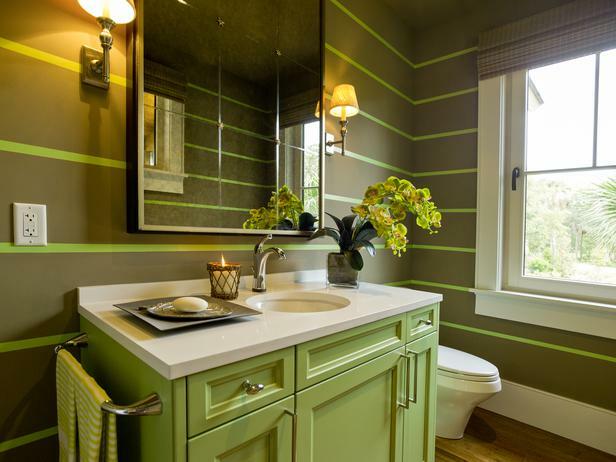 The colors are blah… although that green striped bathroom is quite unexpected and a nice change. I definitely agree with you on the master bath. It looks very outdated and has a staged look. I guess since they are trying to appeal to EVERYONE’s taste, the design can be very neutral. Hopefully whoever wins the home adds some color and more personal touches to spice it up. Oh good…so glad to know I’m not alone in my thoughts on that master bathroom, Nem! And you’re right…the winner would have plenty of opportunity with some of these rooms to add his/her own personal touch. I’ve always wondered what the winners of these “dream homes” do with the houses after they win! I’m in the UK, so I don’t really know about this HGTV thing, but just looking at the photos you put up of what’s supposed to be a ‘dream home’ – I have to say – I really agree with your summary of why you think it’s a little under-whelming. I think we’ve gotten so used to things like Pinterest where we see such a mix of interior design and amazingly creative DIY room, house, furniture and accessory projects – that this ‘dream home’ has failed to meet our higher expectations. Yeah, I’m not in to garages that are featured on the front of the house either. A few UK houses are oriented that way and it’s always disappointing to me. I prefer them to the side, and for the front door to be the focal point – it should be large and welcoming ideally. Don’t laugh, but I love those tall pots with the grass growing out of them. I don’t know why – I just find that the most eye drawing point on the porch! haha! Some nice ideas, I like the little bench & baskets, I like the antiqued mirror (by the way, feel free to do a DIY tutorial on getting the stuff off the back of a mirror to ‘age/antique’ it btw – I always look if you have a tutorial on things first as I find them easy to follow, and that will be an upcoming project of mine). The blue paint isn’t quite my colour – maybe push it in a slightly greyer direction, but not the end of the world. But I’ve seen many more ‘dream’ entrance halls/ways that were just 10x more stunning than that. I have to agree with you – from that angle at least – really underwhelming colour wise. Nothing gets me excited or fluttering over that. Really don’t understand how that can be considered a dream home kitchen…. It’s not special enough really. Plus, I call me ‘simple’ but I don’t quite understand the usage of two different cabinet styles, one is leaning in the ‘traditional’ direction, and the rest of it is quite clearly clean lined modern. Just a tad too incongruous for my liking. Even seeing the dining area cabinets that are matching themselves, still – just not quite clicking. It’s ok. Again, not dream home standard. I’m not super in to green, so they lost me there a little, but even that aside, it’s a nice enough space, and I would be happy to have it in my regular home, just not my dream home. Funnily enough – just a visual aesthetic snap shot – I really like that whole photo – it’s a really pleasing ensemble. I don’t think I’d have a pantry like that as I’m missing some degrees of practicality that I’m looking for – I would have rather shown that kind of love in the dining area – but as a space (rather than it’s function) I do like it. REALLY? This is a ‘dream home’ laundry area? 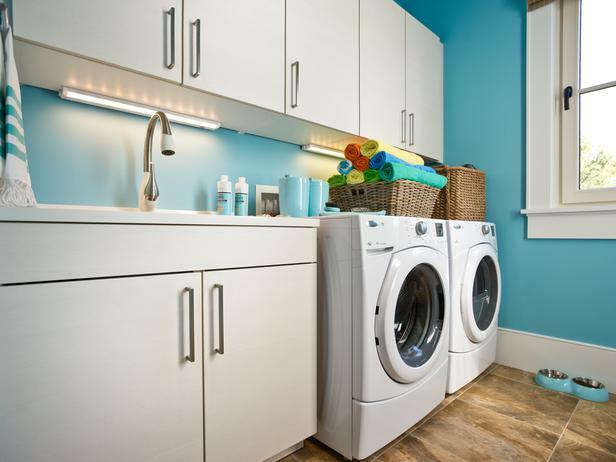 I’ve seen so many more gorgeous laundry spaces just browsing Pinterest. I would never use some that plain-jane as my inspiration (and gosh do I wish I had the SPACE for a laundry area, rather than it just been squeezed in to the kitchen spaces at the expense of the much missed dishwasher) – but if I had a space just for laundry – nope – it just wouldn’t look like that at all ;-D! Totally in love with this room. Can’t pick any holes in it at all. It’s somehow got chic and seaside vibes working with it simultaneously (it’s the colour palette surely?). Those turned bedposts are AMAZING!! My husband is a carpenter by trade, so you can bet I will be on at him to get a lathe so I can give that a try :D! And check the bedside table – YUM! Perfectly nice space for a regular house, but doesn’t reach ‘dream home’ status by a long shot. Maybe the tiling in the wet space could be played with to help give it more punch? If I moved in to a house like that I would certainly be thinking how I could give that space a bit more personality. Although I think it’s a fun space, it’s a bit too much of that one colour (is that aqua?) for me – but otherwise fun spaces. 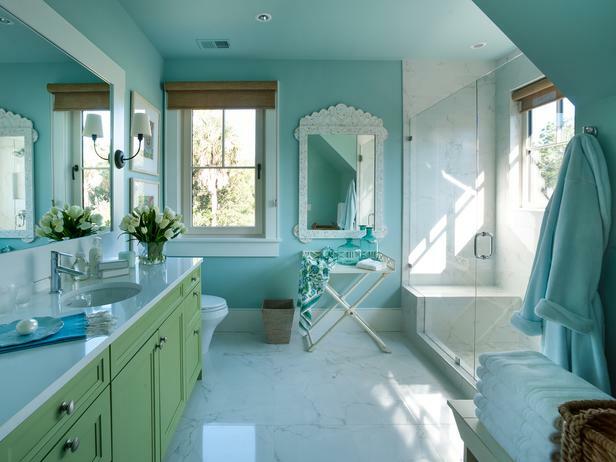 Totally passable – not sure about the mix of that green and the aqua, but it’s a nice enough space. I think a few changes could make that a much lovelier space. Maybe play with the curtain and chair fabric colours? Otherwise it’s all a bit beige, but somehow not in a good way (you know how neutrals can really be amazing at times, but this isn’t quite hitting those sweet notes). Yeah, I’m not loving those tiles either – bit outdated. I quite like the funky chest of drawers and their shape :D! But again, not making it up to the ‘dream’ status. hehe – I wish I loved green that much for interiors, as I think I might like that space a LOT more if I did, but remove my colour tastes out of the equation, and although a perfectly nice bathroom, again doesn’t hit ‘dream’ levels. A LOT of fun – plenty of colour and a nice space. I’ve seen some AMAZING bunk spaces on Pinterest, so this could have gone to higher levels, but that aside, it’s a cute space. I really like the idea of having the TV space off the main thoroughfare of a house – I think it’s too easy to get zoned in to the TV part of life, and there’s much else to be done, so I love anything that sets that space aside and makes it a cosy, family snuggle area. I think the space they created isn’t really ‘dream’, but it’s overall a lovely space. I don’t mean to be unkind, but what ruins it is the two art pieces on the wall. It turns the space in to something 80s and not in a good way. Really, look at the photo, put your hand over those paintings and imagine either just more blue wall, or some other art – suddenly it improves the space. I’ve NEVER seen such an amazing garage space. Really – I didn’t think it was even possible. They’ve really gone above and beyond in that space so that’s really nicely done, and actually does belong in a dream home. I’m so impressed as well at the play/relax/outdoorsie area down there too. Clair! You get an A++ for the most thorough review! Even more thorough than mine! 😀 I loved reading your thoughts on it, and so glad to know that I’m not the only one that finds it a bit blah (overall). And I think you’ve hit the nail on the head…in addition to so many amazing blogs today, I didn’t even consider the amazingness (is that a word? 🙂 ) that is PINTEREST!! We can be inundated with photos of gorgeous rooms in a matter of seconds on Pinterest, and I’m afraid we’ve all become a bit spoiled. So when we hear “dream home” we expect it to be at least as amazing as all of those beautiful rooms on Pinterest. I’m also glad to know I’m not the only one who thinks the artwork in the loft area ruins the room. I didn’t want to mention it in my post, because I was afraid I was coming across as being way too critical. 😀 But since you mentioned it….yes, that artwork has to go! hahaha – well thanks for the A++ Kristi 😀 Much appreciated – I did rather enjoy taking a detailed look at the dream home. Yep, Pinterest has really been a great source of inspiration for so many of us. I must admit our home has certainly benefited from the many ideas, or seeds of ideas I’ve gotten from there. I love that most people just want to set up home in the garage of the dream home :D! hehe! Well, until next time 😀 Have fun and keep up the good work. I totally agree – this is not my favorite HGTV home ever. However, that guest bedroom is gorgeous! That guest bedroom seems to be a crowd favorite. 🙂 I would have loved to see that style and color palette used in the great room! The metal gates are my favorite part! Haha! There are elements I am in love with but I do agree that some things could have been better. And yes, we (blog readers/Pinterest users) are a bit jaded from seeing so much beauty and talent everyday! In my option the dreamiest part of this home is the location! Oh, that’s funny, Amy! One of my least favorite things is your favorite thing! 😀 I guess the world would be a terribly boring place if we all had the same exact taste. I don’t like the decor, those ugly cabinets and some of the colors…but besides that..it is a gorgeous house. Happy weekend. What a gorgeous home!! Love the bunk bed room! I was so disappointed with this one! 🙁 Don’t get me wrong, I’ll still take it. I’d just rip everything out and start over completely. I completely agree with both you and Beth. I was so excited to see that the house would be in the South. I am a Native Californian and newly adopted daughter to the South and I saw no Southern elements in the house at all. Looking at the house, I was taking inventory of all the things I would get rid of first. Those apartment cabinets are ghastly and a majority of the house felt cold. No Southern warmth or charm. While I realize that the outdoors spaces seem like they’d be ideal, the swamp (or “marsh”) mosquitoes would make dinner out of you. Plus, the humidity will make that little pool a nightmare to maintain. I’m not trying to be Negative Nellie either, but am being realistic. HGTV should have done their homework and/or hired a designer from the South who knew what she was up against. Though I absolutely love it here in North Carolina, I would be happy to relocate to South Carolina and like Beth said, rip everything out and start over! 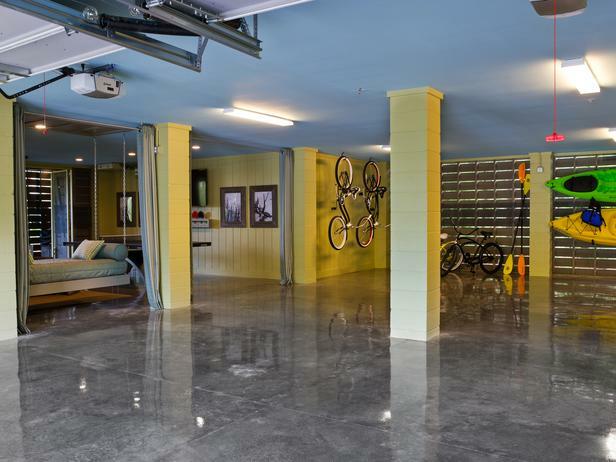 forget the house…….I wanna live in the garage !!!! I thought the same thing, Liz! I’m pretty sure I could be perfectly content there. Ok, I have gone back through the pictures again, thinking I must have missed something! It does not seem like a “dream home” to me at all! 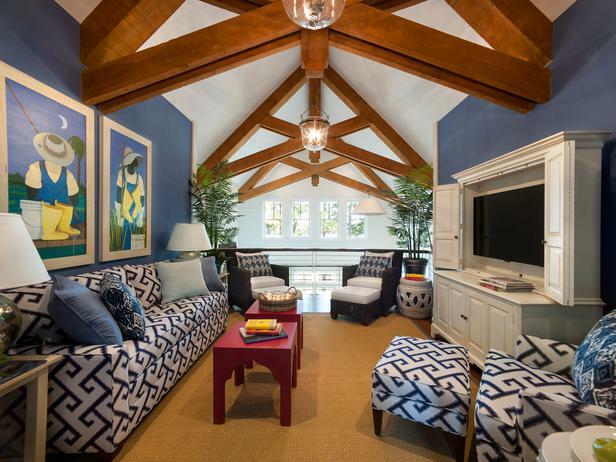 The house itself is actually really nice – love the entry sitting area and the loft ceiling! The decorating is another story altogether. There are a couple of nice pieces and/or colors but… disappointing, to say the least! Do we know where this house is located? It’s in Kiawah Island, South Carolina. Like you, I also went back through the pictures to see if I missed anything and I do enjoy the guest bedroom and twin bedroom. I thought those had the best pieces and more evocative of “Southern” charm. As you said, the rest was disappointing. Most of the interior colors were not really appealing, but I really liked the blues and grey in those two bedrooms. In fact, I kind of want that fawn brindle in my bedroom. 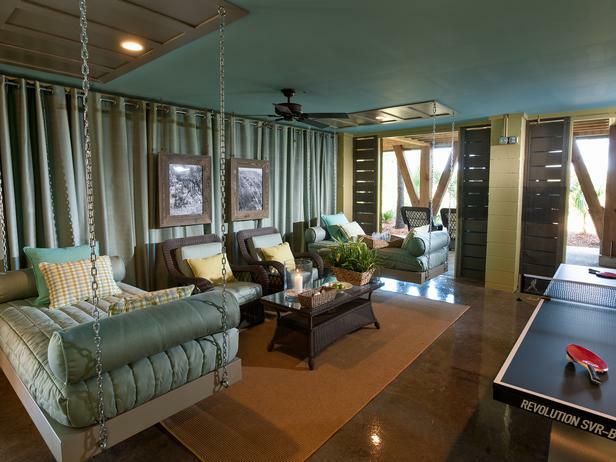 I love the outdoor playroom as well and that bed swing is wonderful (but pretty much any bed swing is am I right?) I really like the outside but they could have done much better inside. I agree with your assessment and Clair’s, too. As I was browsing through the photos and reading what you wrote, I was thinking the very same thing as you–that HGTV should’ve gotten a bunch of DIY bloggers together to do decorate all of the rooms! There are some very fun elements throughout the house…and then in rooms where it counts….it’s just plain ordinary. I’m a bit confused on why it seems so hopscotch. I thought that modern homes were to have flow and I’m not seeing the flow of color and texture between rooms. Going from the entryway to the great room would be odd and the same for the other rooms. I think you’re on track in your assessment. I think the biggest miss for the HGTV team was in the loft. Those beams are so amazing and the room design just does not work with it at all. You’re kitchen corner surely has more pizzazz!! Can’t wait for you to get your ‘dream’ house and see what you do!!! Yeah it doesn’t get my vote for ‘dream home’. There are a few lovely features but not what I would want. Several aspects which I would like to highlight. In the second and other outside pics the road can be seen, which means the garage is actually to the side of the house and is not in fact visible from the road. And the garage wins the vote for ultimate ever garage. In Australia, all pools must be fenced for safety. There is no fence around this pool,between the deck and the pool. At least it isn’t needed on the outside, but a glass wall on the deck side is essential. A child could wander from the deck and fall straight into it. Even if one didn’t have children oneself, surely this is a HUGE over sight. There is no gate at the top of the stairs and no fence on the yard to prevent entrance either. Why so many bathrooms? It seems excessive. Am I the only one who doesn’t love cleaning bathrooms? Also why is there no tub in the children’s bathroom? Young children tend to bath more than shower and this makes the house unsuitable for kids yet it features two children’s rooms??? Seems incongruous to me. Either design a house with children in mind and accommodate their specific needs OR don’t, but don’t do it half way because that works for no one. One more gripe – the kitchen is wrong on just about every level. Even if just for staging and not real use, why would anyone put those hideous planters of grass on the kitchen benches? they would look lovely on the front verandah, but on the kitchen been it just makes me cringe. Finally, for a house to win my vote as a dream house it must be both beautiful and practical; everything must flow and function and make life and living in it a pleasure. This house just fails on most of my criteria. I one of my biggest pet peeves is when the garage doors are the focal point! As near as I can figure, the front porch actually is street side, and the driveway/garage is on the side of the house. They didn’t display a picture showing the front of the house for some reason, maybe it’s not as great as they wanted when looking straight on?? Anyway, all I can say is it’s my MY dream home. 🙂 I do like the showers in the guest and bedroom bathrooms. We must have been BFF’s in another life!! I agree with every single thing you said! It’s like they had two different designers (one who loved color & one who was afraid of it) working on this house together. THE CABINETS!!! We’re they over budget at that point? Believe me, I would take the house but I would start planning some changes right away. I’m so glad you asked this because I was so disappointed when I saw this new house. The first thing on the entry way into the house the palm trees look odd because nothing else is tall except them and the house. No color in any of the plants as you walk up the long driveway. Looking out from the house I think that’s my favorite but I would move the chairs they’re blocking my view. Once on the front porch the 4 containers filled with what looks like grass not my favorite. Being a landscaper not much of a welcome statement there. 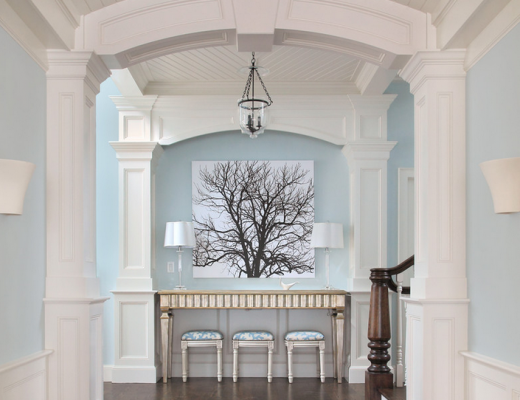 I do however like the light blue walls and the darker furniture. Entryway: Why a big mirror in a small nook and why what looks like a small bed there with curtains? Don’t get it and color is too bold in that small space. Great Room: Total agree with you on that fireplace wall why a two large gates. The fireplace is cream if you need to put anything there put a great colorful piece of art. 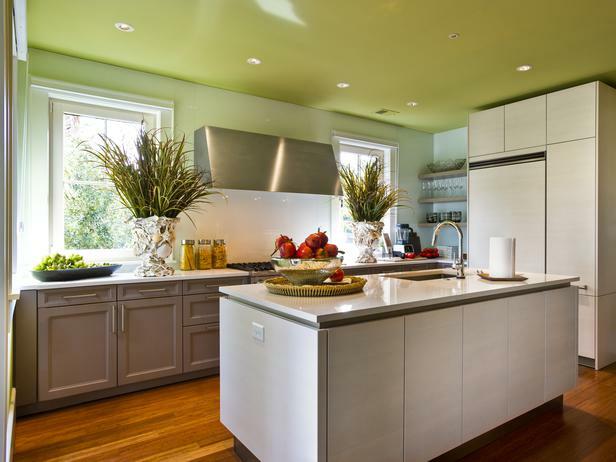 Kitchen: Blah green ceiling and no other colors on the walls. No back splash that could have open the space a little more. Possible a glass back splash. Dining Room: It’s okay, but I’m not liking those huge two lights coming down, I find they don’t go with those wicker chairs. Pantry: Boring as well with outdated curtains on the drawers. 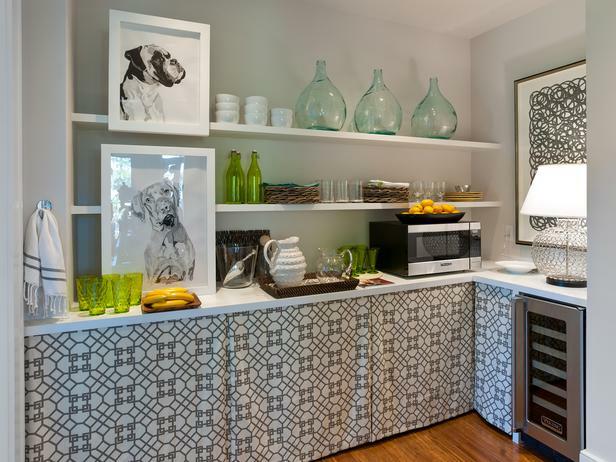 Usually pantry are for things you don’t openly see so why is it that they put two pieces of dog art there. Laundry room: Too bold of a color they either went no color or to strong of a color. I like creative flow not how this house was laid out. Guest Bedroom: From the looks of it they all look like there on a slant so high post on the bed make the room look smaller. I hate the typical 4 pictures on a blank wall. Sometimes it’s okay to have a blank wall. Guest Bathroom: Absolutely no color and there should be it’s to white.Kids Bedroom: Everything doesn’t have to match everything doesn’t need to be that blue. So many beautiful blues that would have been so much better. I hate the bedpost in here as well what kids loves these. In a large bedroom with enough room and a tall ceiling by all means yes but when the bedpost looks like it’s hitting the fan no so much. That’s my opinion of the Master Bedroom I feel the room is too crowed and the bed post look strange. Master Bathroom ugliest tiles I’ve ever seen on the floor and on the walls. Hasn’t any one gone to Ann Saks? they have beautiful tiles. Stripped Bathroom looks good, it’s small but it feel like everything at least is matching. The bunk Room: I think it’s odd that picked Dark Blue for the walls were the beds are. Dark here always makes you feel like your in a cave. I don’t know maybe they were going for that but then the other walls are a lighter blue and the ceiling is blue and the bedspread is blue what gives with all those blues. Upstairs Loft. Too much furniture the room looks stuffed and the ceiling looks massive and low so everything then looks over crowed. Too much seating and two large pieces of art make it look to me over crowded. The Garage looks so pretty I almost feel like I wouldn’t want to put my car in there. I would love a craft area though. All and All I was disappointed in the house I felt they could have done so much better I also agree there’s so much beauty on Pinterest I guess we are spoiled. That kitchen is nothing special. In fact, I like mine better! Perfectly fine cabinets on the main wall and into the dining area, then those awful flat things on the island and around the refrigerator? I like everything about the guest room. The striped area rug, the art, the wall color, the furniture, everything. I like that playroom off the garage. 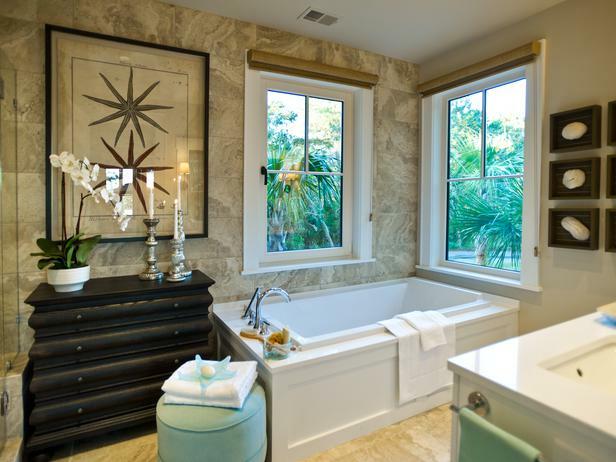 I like the guest bath, even though it is a bit plain, it is spa-like and serene. I like the black touches. Do not care for the master bedroom, too….. beige? if that rug was some sort of blue, id like it better. Do not care for the master bath tile either. It would have been just fine with a different tile. I like the outside, the shingles, the porches, and the landscape looks like it mostly made up of plants native to the area, which is always nice. All in all, it is nice, but not exactly my “dream” house. I agree with almost all of your observations. The only rooms that really inspired me were the kids’ bedroom and bathroom. I’m glad I’m not the only one who is turned off by a “focal point” garage. I’m sure there are others–but every time I’ve ever mentioned it to anyone, they’ve looked at me “askance,” LOL. I agree the shingles are wonderful. I agree with you! Another major concern of min came in with the floor plan. The only entrance to the laundry room is through the pantry in the kitchen. Doesn’t that seem bizarre! While the exterior and deck had me expecting so much the interior was kind of ‘meh’ for me. Can you please tell me the color of metal roof? This looks amazing|! I love it! Does anyone know where furniture & bedding was purchased? A great deal of it reminded me of Pottery Barn, but would love if anyone has specifics – especially for the guest/master bedrooms. I agree with you on a lot of your points, but overall, a beautifully done home. Perhaps HGTV will get word of your final few comments & surprise us all next year! 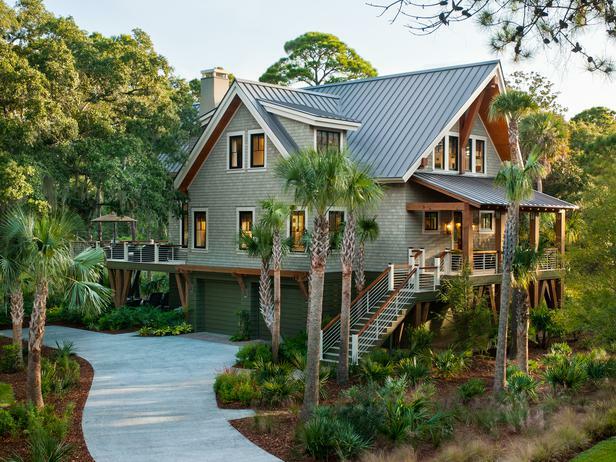 Excellent review of the dream home and what caught our attention at first is the metal roof – these are becoming more popular in Florida. Thanks for the ‘walk through’! and images.